Thank you to Rubbermaid BRILLIANCEⓇ for sponsoring this post. All thoughts and opinions are my own. 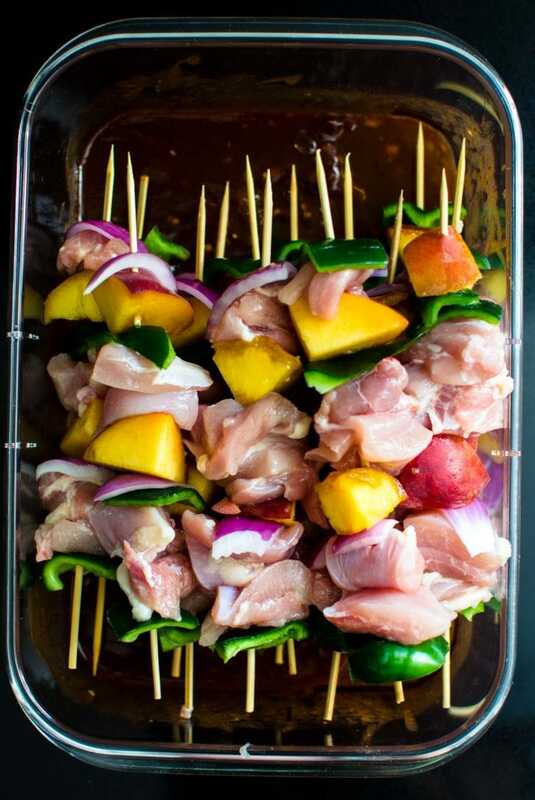 Hello sticky sweet Peach BBQ Chicken Kabobs – you and my grill are going to become good friends! This summer has been the summer of grilling for Ryan and I. Why is this just now a thing for us? Well, it’s the first summer in our married life that we’ve been lucky enough to own a grill. And really, I can’t get enough of grilled goodness! Actually, it’s Ryan that’s doing the grilling – and he’s getting REALLY good at it! I tend to be a little territorial in the kitchen, so he’s been thrilled to have a grilling as a “thing” of his own – and I couldn’t be happier that he’s making me dinner! Watch this quick video to see exactly how I made these kabobs! 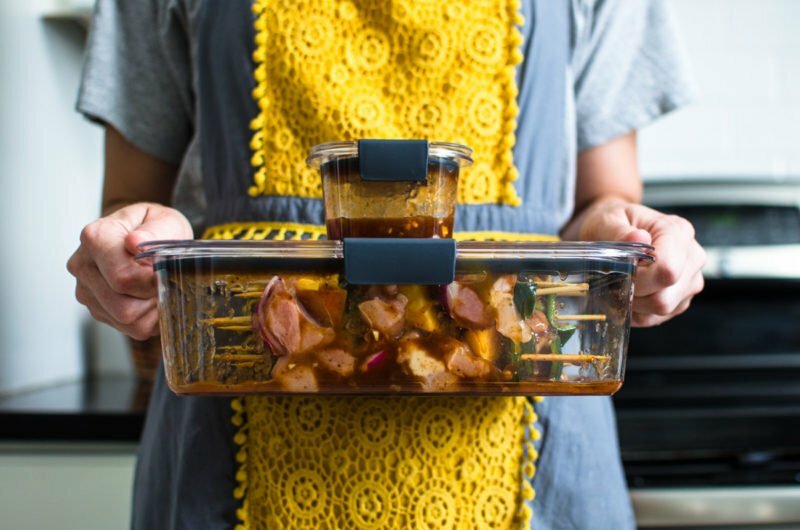 How to Marinate Without the Mess! When it comes to planning a grilled feast, I like to make things easy on him and do all the ingredient prep work. 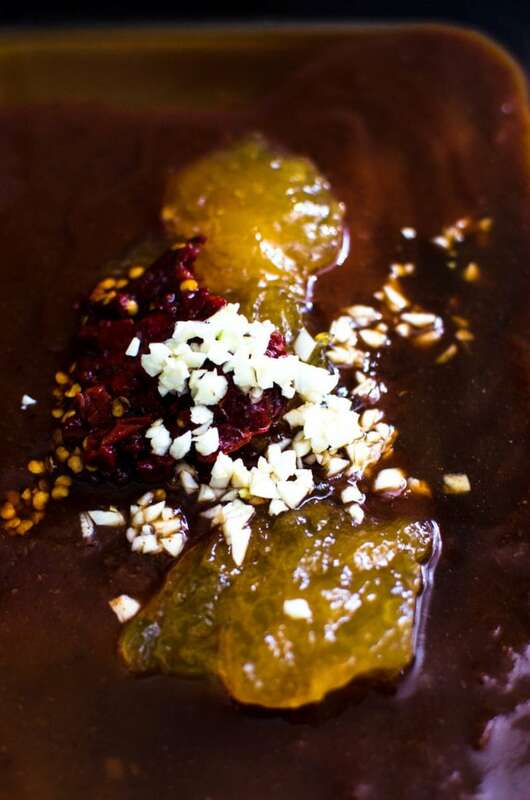 Up until recently, I had not done a lot of experimentation with marinades because I just thought they were too messy. Every time I try to marinate food – whether it be in a plastic bag or storage container – I end up making such a mess. Either it leaks in the fridge, or ends up spilling when I try and shake up the container so all the food gets coated. That was up until I met the storage containers of my dreams. Friends, let me introduce to you the line that is Rubbermaid BRILLIANCEⓇ. It’s legit and I’m in love. Seriously, these pieces are a meal-prepper’s/lunch-packer’s/freezer-filler’s dream. First of all, these containers DO NOT LEAK. Nope, not a bit. I shook the heck out of my container with these peach BBQ chicken kabobs to make sure all were evenly coated and not a drop of marinade escaped from the lid. Score. And the next day I took my leftovers to work and reheated them like a dream. I had full confidence in doing this because the lids are BPA-free, AND you can open the latches while heating to vent your food as it warms. And you know what else??? I made a double batch of kabobs in the marinade, froze one-half, and am delighted to know that I can thaw them in the marinade and have them grill-ready whenever the urge to grill strikes again. How much more awesome/easy/delicious could this situation be? Oh – and one more thing – I have a lot of OLD plastic storage containers that have tragically stained whenever I’ve stored tomato-based products in them. They don’t look pretty in my cabinets anymore. Not so with the Rubbermaid Brilliance! They are stain-resistant and will keep their crystal-clear sheen use after use and wash after wash. 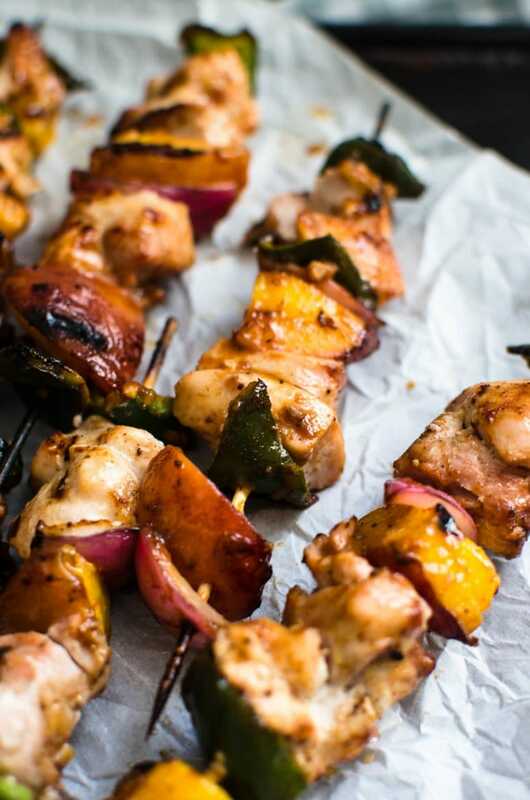 If you get a chance to make these Peach BBQ Chicken Kabobs, I’d love to know how it turns out for you. So leave a comment below! I’d also love to feature your creation in my monthly newsletter, so you can upload a photo to Instagram or Twitter with the tag @sweetcayenne5 to be featured! For more peach recipe goodness, be sure to check out my homemade Peach Bourbon BBQ Sauce, Peach BBQ Chicken Pizza, Peach Bellini Pie, Pecan Butter and Peach Jam Crumble Bars, and Fresh Peach Salsa! These easy Peach BBQ Chicken Kabobs have been one of my favorite meals this summer - they are easy to marinate in Rubbermaid Brilliance containers! Combine the first seven ingredients (through the soy sauce) in a large Rubbermaid Brilliance container. Stir with a whisk to combine. Remove ¼ cup of the sauce and place in a small Rubbermaid Brilliance container and reserve for later. Add 2 tablespoons of oil to the remaining BBQ sauce marinade. Set aside. 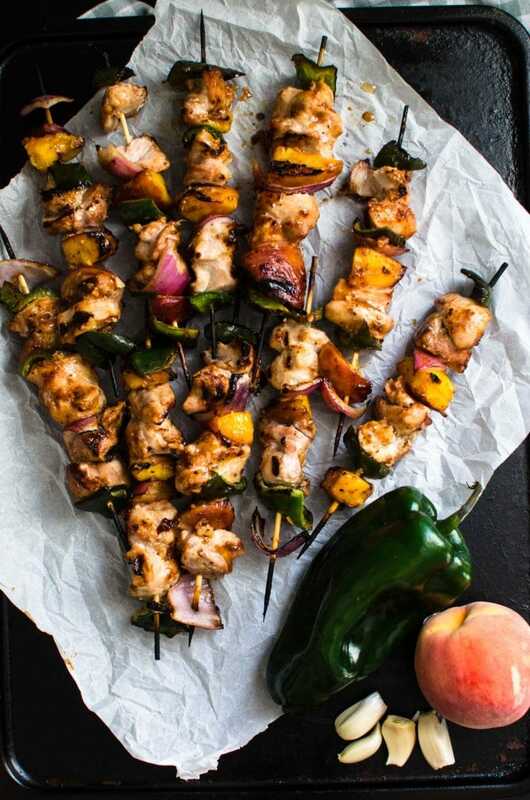 Place the chicken, peaches, poblano, and onion on the skewers in alternating patterns. 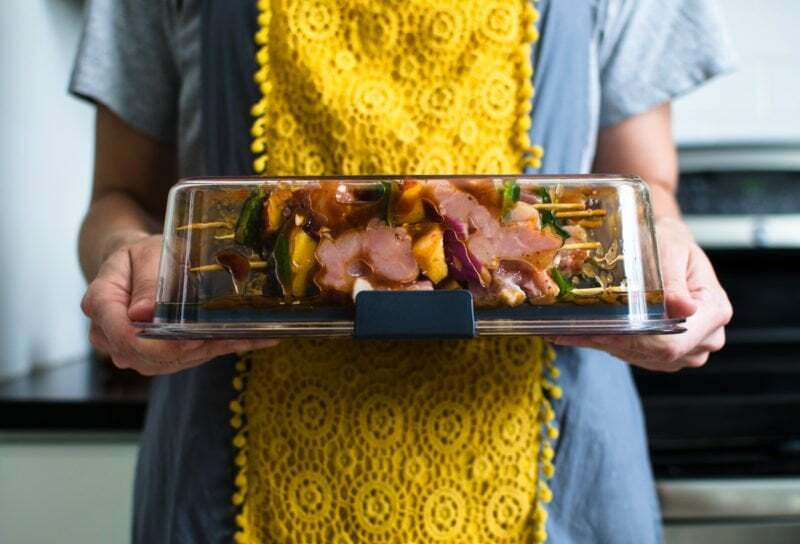 Place the skewers in the BBQ marinade and then seal the container with a lid. Shake the container to coat all of the skewers evenly. Refrigerate to let marinate for 30 minutes, turn the container upside down, and marinate an additional 30 minutes. 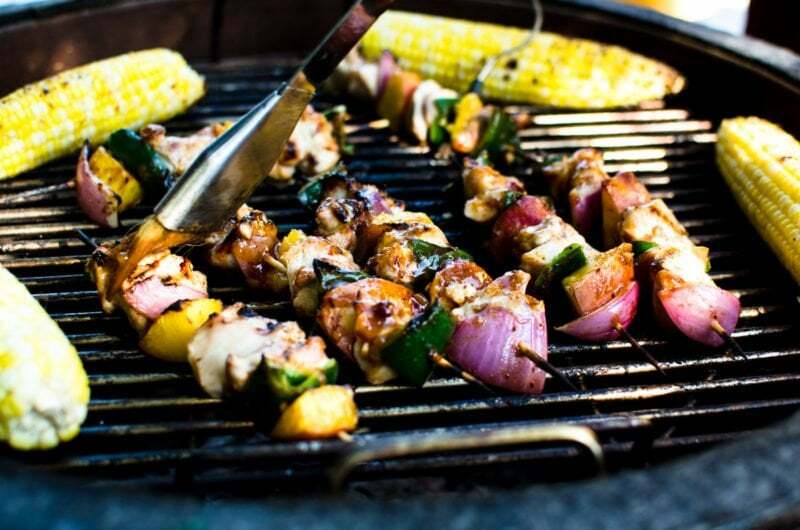 Prepare your grill for grilling over medium heat, about 400 degrees F.
Place the skewers on direct heat and grill for 5 minutes. 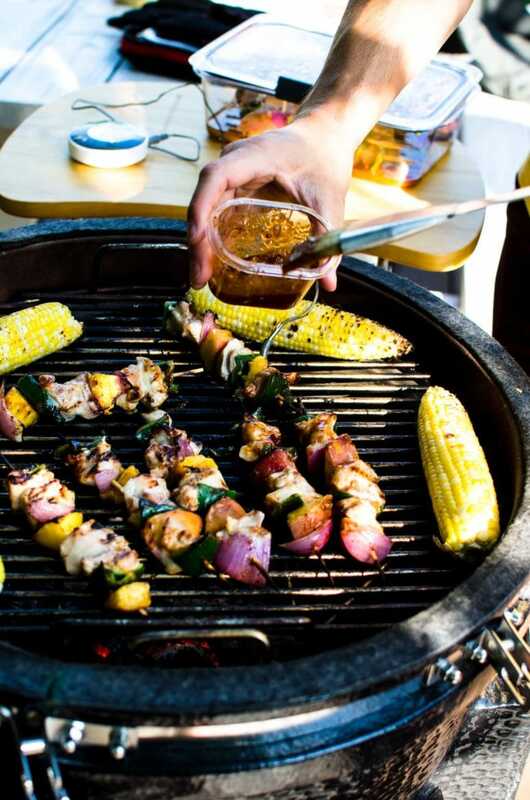 Flip the skewers over and brush with the reserved ¼ cup of sauce. Grill the skewers for an additional 4 minutes. Remove from grill and brush with a final coat of sauce. Serve hot! Hi Cynthia! I just added a nutrition label to the recipe 🙂 But to specifically answer your question, the kabobs have 25.4 grams of carb per serving, with one recipe making 6 servings total. Thanks for stopping by!